Global Traffic Network, Inc. (Nasdaq: GNET) has entered into an agreement to be acquired and taken private by an affiliate of GTCR, LLC in a transaction with an approximate value of $267 million. Under the proposed agreement, GTCR will begin a tender offer for all of the outstanding shares of Global Traffic for $14.00 per share in cash. Kyros Law is a Boston-based law firm has launched an investigation concerning potential legal claims against the Board of Directors of GNET for this deal. Our law firm is interested in speaking to investors because we are investigating whether Global Traffic’s board of directors adequately shopped the Company to obtain the best price possible for Global Traffic’s shareholders before entering into the agreement with GTCR. On Yahoo! Finance an analyst recently set a $16.00 per share target for Global Traffic stock. On May 13, 2011, Global Traffic Network stated in a press release: “We anticipate solid growth this quarter and a strong finish to the fiscal year. Our Company continues to generate strong free cash flow and maintain a rock solid balance sheet which has no debt and almost $2.00 per share in cash. We continue to be well positioned in the advertising market place, with no significant direct competitors, an extremely effective product and a seasoned, experienced sales staff.” -William L. Yde III, Chairman, CEO and President of Global Traffic Network. Is the company now being undersold? 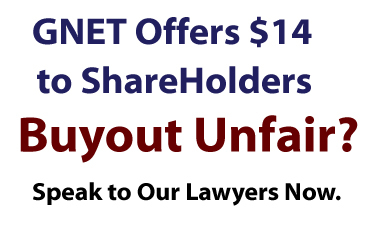 If you believe your GNET shares are being undervalued in this buyout deal call us now. If you are a shareholder of any amount of GNET stock please call Attorney Bill Kyros at 1-800-934-2921 to discuss your rights. Merger Lawsuits (see Our Main Page): In these types of cases even small shareholders may bring claims against officers and directors of a company for violation of fiduciary duties related to these large corporate transactions. The goals of taking legal action are to increase the deal price, require public disclosure of important facts related to the transaction (which helps investors decide whether to approve the deal), improve the actual terms of the deal, and to ensure fairness to all shareholders. Own shares of Global Traffic Network (GNET)?